Why Join a Cohousing Group? 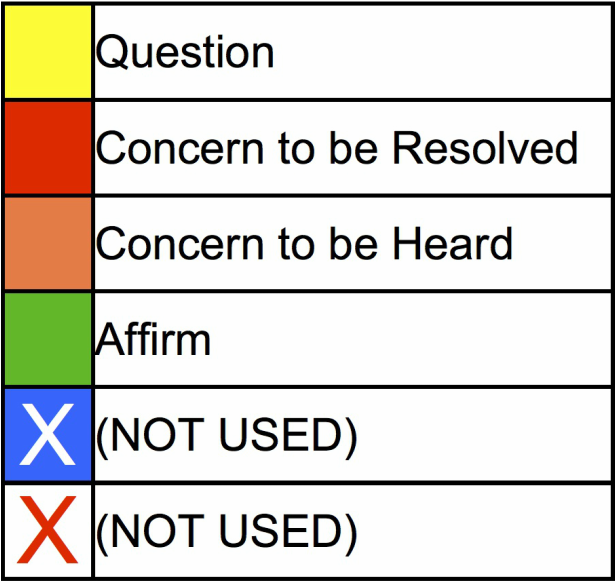 The Colors of Clarification System is designed to move discussion more efficiently by allowing the facilitator to choose member input in the most appropriate sequence. Members wanting to speak communicate their intentions by holding up a colored card. 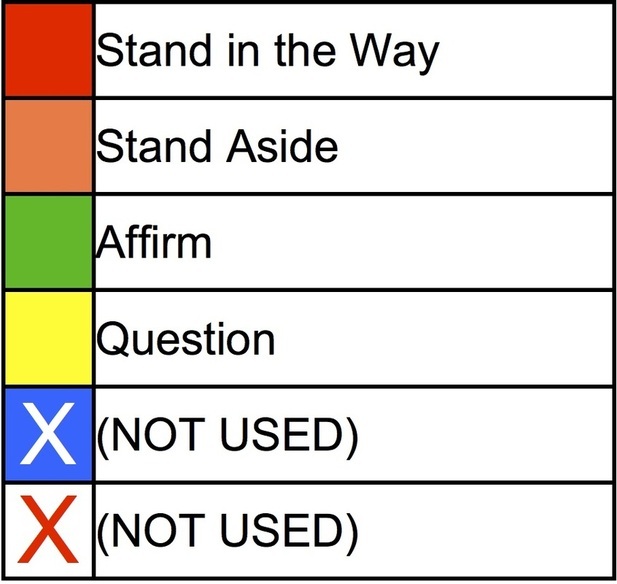 The facilitator chooses speakers in an order based on the color of the card each speaker is holding up. The cards are also used to take straw polls and for voting. There are 5 colors, each having a different hierarchy and meaning. Each participant has a set of all 5 cards. For a thorough description of the Colors of Clarification System, see The Cohousing Handbook, pages 27 and 28. A Talking Circle is especially helpful in slowing down or cooling down a discussion, improving listening, and equalizing speaking time. It is often helpful to proceed the Talking Circle with a period of silent reflection. Each person takes a turn speaking or they can pass in any given round. An object can be passed around to signify who has the floor. Talking circle can consist of one or more rounds. Members wishing to speak raise their hands and the facilitator gives them each a number indicating the order in which they will speak. This is generally not as effective as the Colors system, but the two can be used in conjunction. Gets people who feel strongly about an issue to talk. 4 – 6 people sit in the middle of the larger group, a circle within a circle. They each make their point, possibly followed by discussion. When someone in the center feels that they have been heard, they move to the outer circle and someone else takes their place. Good for generating dramatic new alternatives. Encourages creativity and detachment from one’s own ideas by stressing quantity rather than quality of ideas. A myriad of ideas, however absurd, are encouraged. No evaluation of any ideas while brainstorm is in progress. After the brainstorm, ideas are evaluated and built into proposals. Good for quickly generating and prioritizing new ideas. Split up into groups of 3 to 6 people each. The group stands near a wall or surface. Each person has a bold marker pen and a post-it note pad. In response to a particular question, everyone comes up with ideas. When a person has an idea, they write it, say it, and post it. When time is up (a few minutes), the ideas can be grouped by moving around the post-it notes. The ideas can then be prioritized before reporting back to the entire group. Allows everyone a chance to reflect and formulate their ideas. 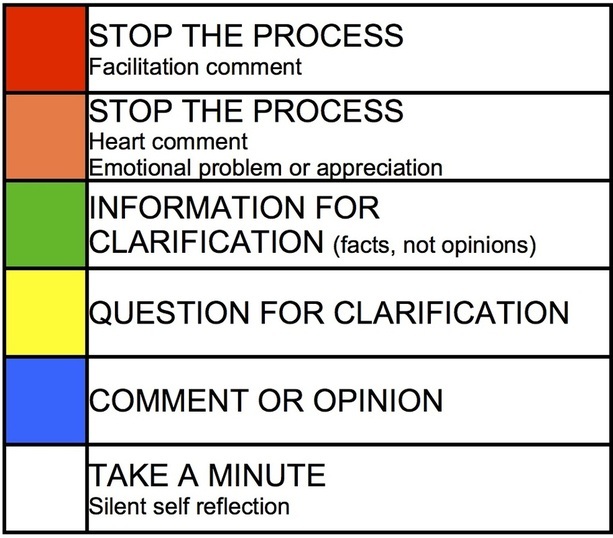 Good for diffusing emotionally charged discussions. Gives slower thinkers a chance to get involved. It’s often useful to follow a silence with a Talking Circle. Good for quickly gathering ideas, creating a skeleton plan, and energizing a group. Define issue questions to address and write them up on flip chart. Divide entire group into small groups, one for each issue question. Each person needs a clipboard or pad to write on. All people simultaneously circulate asking people not in their small group to answer their issue question. Make sure to get new answers. Move on quickly. After 5 or so minutes, small group gathers and prioritizes top 5 ideas on a flip chart. A useful exercise for dealing with people’s worries and developing empathy and group solidarity. Can also be used for other feelings besides fear. Each person writes down a fear they have about a problem and puts the unsigned slip of paper in a hat. The hat is passed around and everyone chooses a slip of paper from the hat, reads it aloud, and says how he or she feels about it. Everyone sings, dances, yells, does yoga, or something physical to get their juices jangling. Gets people involved again. Helps overcome boredom if things are dragging. “Magic Blob” is a game in which an imaginary blob is passed around from person to person transforming itself as it goes. “Touch Blue” is played by having someone call out blue, or leather, or stripe, etc. and everyone touches that item on someone else. Role playing can work well to liven up a discussion. Ration each speaker a set number of minutes. A very effective way to do this is for the Time Keeper to use Time Cards. There are 2 cards, preferably fluorescent yellow and fluorescent red. Gives more people a chance to talk. Keeps the meeting on schedule. Can be used in any discussion including Talking Circle. Ration each member a set number of tokens, each is good for one turn speaking. Can be used in conjunction with Time Limits. Ask quiet member(s) if they have something to say on the topic. Use Brainstorm, Talking Circle, etc. to get everyone involved. What if this idea were implemented? What would be the best, middle, and worst case results? Identify the three cases and assign probabilities to each outcome. Afterwards, do another quick consensus check. Have anyone’s ideas changed? Do they see the situation differently? List pros and cons of each position and discuss ways to manage or mitigate the cons. This discussion helps move people off center because they see more benefits to the other position or see how to mitigate the negatives. What would have to change for you to support this? How could we modify this option to be acceptable to you? Would some variation of this idea work for you? Then present the modified option to the group. Can everyone support it now? Keep looking for modified options that the group can support. Purpose: To get people to look at a situation from fresh perspectives and to build consensus. Use PNI (positive, negative, interesting) if a number of people are split on an idea (pro, con, neutral). Divide the group into three teams (Pro, Con, and Neutral). Give each a flip chart. Have the Pros brainstorm what’s positive about the idea; the Cons, what’s negative; and the Neutrals, what’s interesting. Then have them rotate to the next flip chart: Pros list the interesting things, Cons list the positives, and Neutrals list the negatives. Rotate again. When everyone is done, tape the positive lists on one wall, the negatives on another wall, and the interesting things on a third wall. Discuss each of the lists, allowing group members to ask questions for clarification, and then ask if looking at the issue this way has changed anyone’s opinion. This is often a very powerful way to help people see other sides of the issue. Why should it be adopted? What does it fail to do? Why should we reject it? How does it intrigue you? What could be done with it? How is it strange or unusual? In what ways is it appealing? What if this were reality? What does it remind you of? What if it came later / earlier? What it were more ______? What it were less ______? Why hasn’t it been thought of before? What’s unusual or odd about it? What strange thing is this like? To compare options and evaluate them against a set of common criteria. To facilitate decision making and consensus building. To provide a rational framework for decision making even when quantitative data is not available. Build a criteria matrix when you have a number of options to examine and can develop criteria for comparing them. On a flip chart, create a matrix like the one shown below. Rank the criteria from most important to least important and list them down the left column. To indicate their relative importance, weight them on a scale from 10 (highest) to 1 (lowest). Then list the options across the top of the matrix. To complete the matrix, provide a raw score indication how well each option meets each criterion and multiply the raw score by the weight to reach a weighted score. By adding the weighted scores in each column, you arrive at an overall sense of the relative merits of each option. It’s usually best to have individuals or small teams come up with raw scores on their own and then work through the matrix with the whole group. People are bound to disagree about the raw scores, but that’s part of the process. During the discussions that follow, try to reach a consensus score for each item. The actual numbers and weighted totals are far less important than the process of evaluating the options against common criteria. During the process, groups often discover decision criteria they hadn’t thought of, new options, and other factors that will impact the decision. A criteria matrix is helpful, especially when the decision will rely on qualitative factors. Conflict will arise in meetings and much of it will be constructive to the consensus process to the extent that it helps clarify discussion and improve proposals. As Facilitator (also Keeper of the Heart), it is your responsibility to assess the conflict and determine whether it is having a positive or negative impact on the meeting, and what to do about it. As you move through the following decision tree, you may want to ask the entire group for their input on the conflict (Is this OK? What should we do?). In the case of heated conflict, refer to the section on WHEN PEOPLE GET VISIBLY ANGRY below. Decide if the conflict is contributing to or interfering with the meeting. If contributing: Let the conflict proceed and facilitate as necessary. If interfering: Decide if the resolution of the conflict in the presence of the whole group would benefit the group. If yes: Proceed with resolving the conflict by following an abbreviated form of the Conflict Resolution Techniques found in the “CONFLICT RESOLUTION” document. The people in conflict may want a mediator from the group. If no: Decide if time should be taken now outside of the meeting for the people in conflict to get resolution or if the people in conflict should get together later (before the next meeting) to resolve the conflict. You’ll want to consider how quickly you think the conflict can be resolved and the urgency of the meeting issue on the floor. If now: Adjourn the meeting for 20 or 30 minutes and have the people in conflict find a quiet place to work on resolution using an abbreviated form of the Conflict Resolution Techniques found in the “CONFLICT RESOLUTION” document. They may want a mediator from the group. If later: Ask the people in conflict to get together to resolve the conflict before the next meeting using the Conflict Resolution Techniques found in the “CONFLICT RESOLUTION” document. You will probably need to table the meeting issue sparking the conflict until after the conflict is resolved unless the people in conflict are willing to abstain from participating in the issue. Interrupt calmly, keeping your pace slow, remind them of the Purpose of the meeting. Declare a 30 second silent time out or a stretch break for the participants to refocus on the Purpose and to come up with productive, constructive input. Adjourn the meeting for at least 90 minutes because that’s how long it takes the “anger” hormones to subside. Speak slowly and calmly. Breath deeply. Remind them of your role and your commitment to being sure that everyone is heard and the meeting Purpose is served. Ask them to state calmly and quietly what their objection is. Remind them that everyone agreed to the Ground Rules. Ask them if they have changed their mind about this. Look puzzled and ask what their intention is. What are they trying to accomplish? An exercise to practice understanding rather than arguing. Pick a partner that you disagree with. Learn your partner’s view of topic. The goal is for the partners to trust each other to accurately represent their view point. Goal is not to change partner’s view point. Start with a topic that is not too contentious. Our beliefs affect the data we then select next time. Our beliefs are based on real data. The data we select are real data. Reflection: Become more aware of your own thinking and reasoning. Feedback: Inquiring into others thinking and reasoning. Disclosure: Making your thinking and reasoning more visible to others. Where am I feeling it? Why am I feeling it?